Looks like we're out of the woods with the previously forcasted freeze. Which is a good thing for the fall garden left-overs. Although we're going to have wind and heavy rains, the freezing temps are not going to materialize. Still looks to me like a good day to just lie around and chew bones. 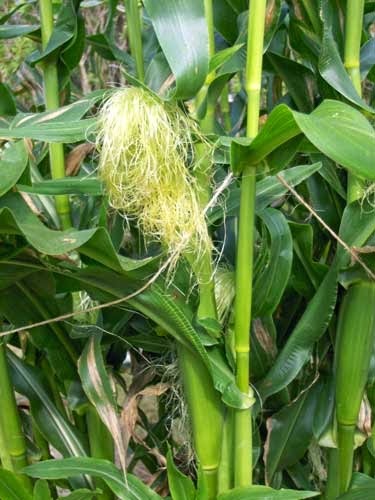 With any luck, in a couple of weeks the corn should ripen up before the colder weather gets here for certain. As you can see, the corn is almost there. Thought about putting them in the greenhouse, but they are way too tall. It's incredible they gree this big in a pot. (See our "Self-Watering-Container-Pots" construction and soil mix. 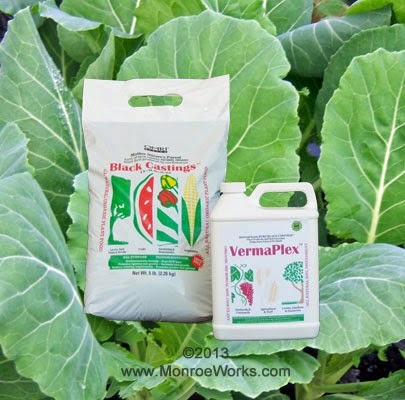 No extra nitrogen was need, just the worm castings and VermaPlex®.) 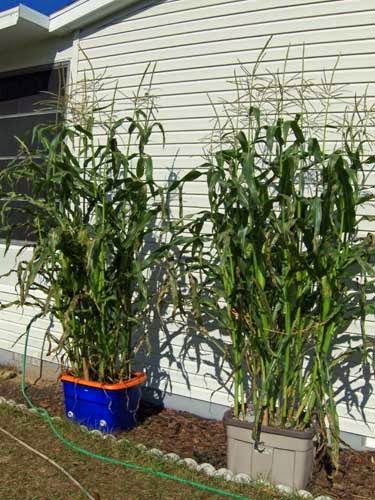 I'd say, these results show you can grow corn successfully using this method. We'll do what we can to keep the corn going in hopes of being able to harvest it. What did we learn? For the fall garden, we need to get corn planted by early September. Even though it's very, very hot and the sun is very, very strong, it will be easier to protect them from the sun while they are still small than to deal with the November frosts and freezes when they are giants. Gardening in North Central Florida has been more of a challenge than we ever could have anticipated (I'm speaking for Bill and Kayce, of course. Quite frankly, I don't do "anticipation". Living in the moment - that's ole' Digger). But, as we (they) build up our sandy soil over time, these self-watering containers are proving to be a viable way of vegetable gardening in the meantime. Perhaps, we (they) may just dispense with the in-ground garden altogether and stay with self-watering container gardening as our (their) only growing method. As for me personally, I'm not that emotionally involved, being a carnivore and all. Tomorrow we'll check out the green house, where all our pepper and tomato plants are hanging out. And where I've found some tasty little rabbits, I might add.